Aerial Duel at Cattail Marsh! While at Cattail Marsh recently, I found these two Northern Shoveler drakes in an aerial duel and it continued for at least 20 minutes. It is approaching that time of the year that they pair up with a female. My guess is that one was invading the space of the other and the fireworks started! Awesome flight shot! Superb clarity! What a great chance to see and shoot this interaction--so often they are just sitting on the water. This is wonderful. 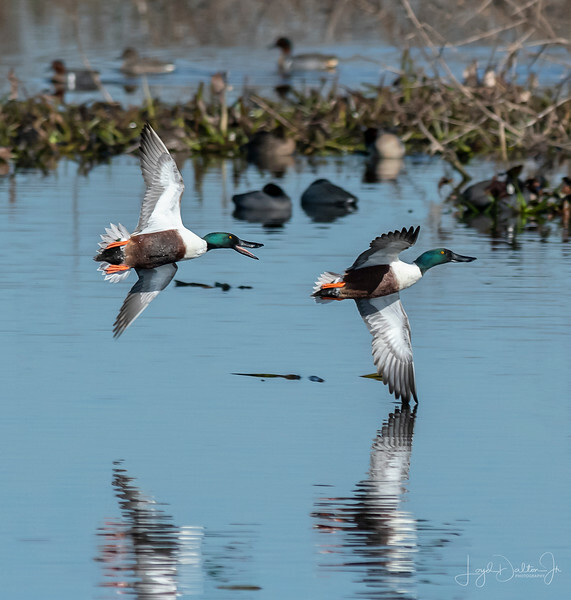 Nice pair of Shoveler in flight. Great shot. Super capture of the interaction...nice reflections, as well!